are essentially a green top plant before the bulbs start to enlarge. We sort out the jumbo shallots and offer them at the market through July. 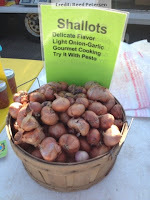 By marketing them through the summer we have shallot coverage through nearly the whole season. This is pretty amazing when you think about it. They store at nominal conditions for nearly 10 months. Wow that is pretty amazing. We planted some single file rows with a little extra fertilizer to get a few extra jumbo shallots. 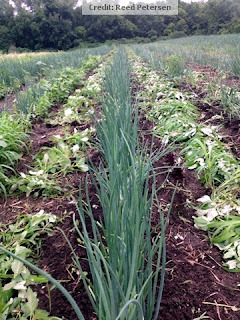 Shallots don't compete with weeds very well so we weed them diligently all season long. We start harvesting around labor day. Let them dry and cure in a shady place. Then sort them into baskets or apple boxes. They keep well in a cool dry place such as a shelf in the garage or basement. That brings us full circle to the next year. Plant, weed, harvest and repeat. I bought the shallot seed we are currently using over 10 years ago. The variety does well in our climate and has held up well from year to year. Shallots are a clone of the parent material similar to potatoes. So there are no population requirements to maintain the genetic diversity. If we get a rain in the next week or so they will start to root and sprout. Somehow they know they are in the soil and not in storage. They will be up in 7 to 10 days.